For almost a year Daniela has driven the kids and I into the daycare where I’ve gone in to drop them off and then walked the mile to my work and Daniela has taken off for her long drive to her work. At the end of the day I would walk to the kids and then load them into the stroller and/or carrier and walk the mile and a half home from there. 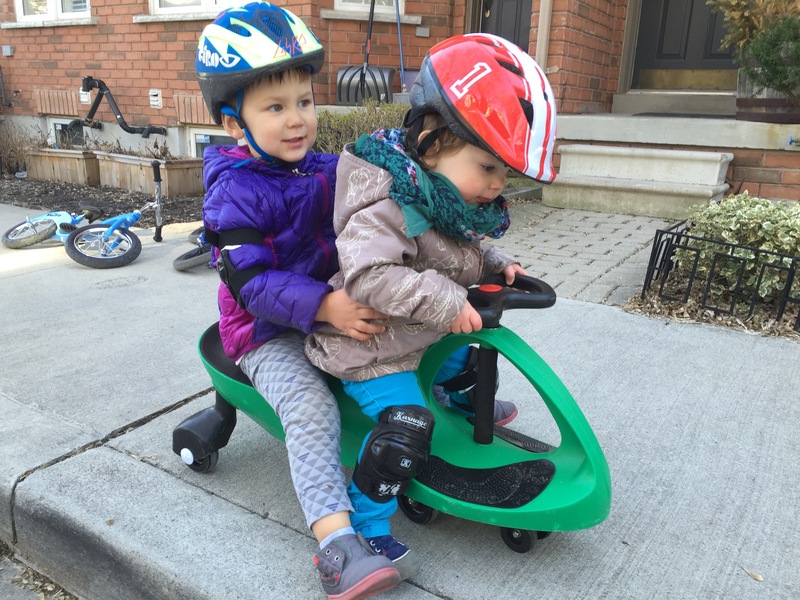 I hurt my shoulder in March and since then the carrier hasn’t been an option and I’ve needed to use the double stroller which, while magical, is a pain in the but on narrow city sidewalks. 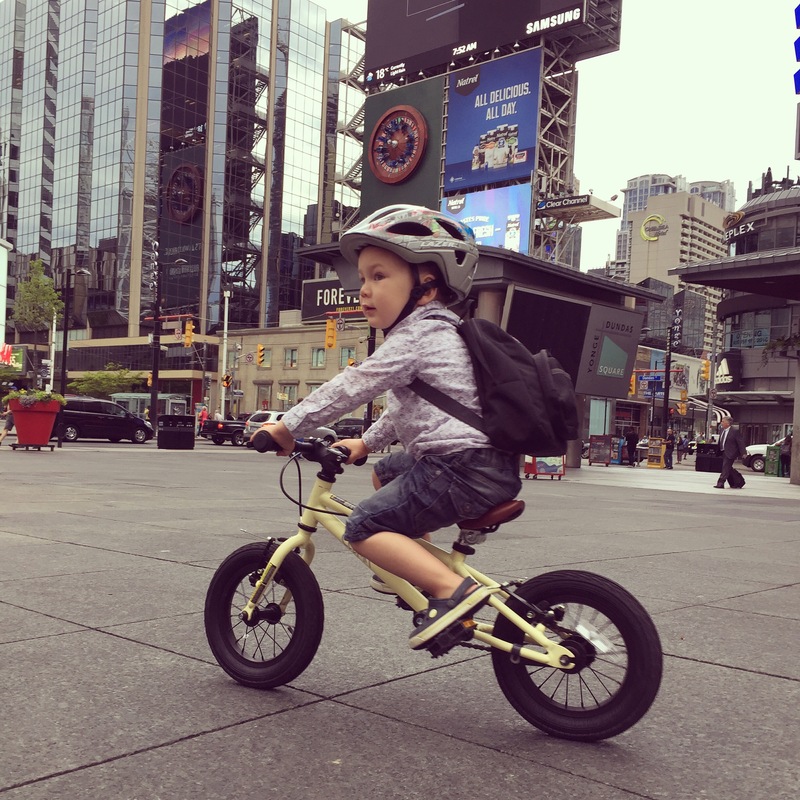 In April after some trial runs to the dog park and then to Karate I felt like Carter had reached the point of being able to ride his balance bike home from school. A mile and a half seemed reasonable but I was also prepared for it to be a flop. 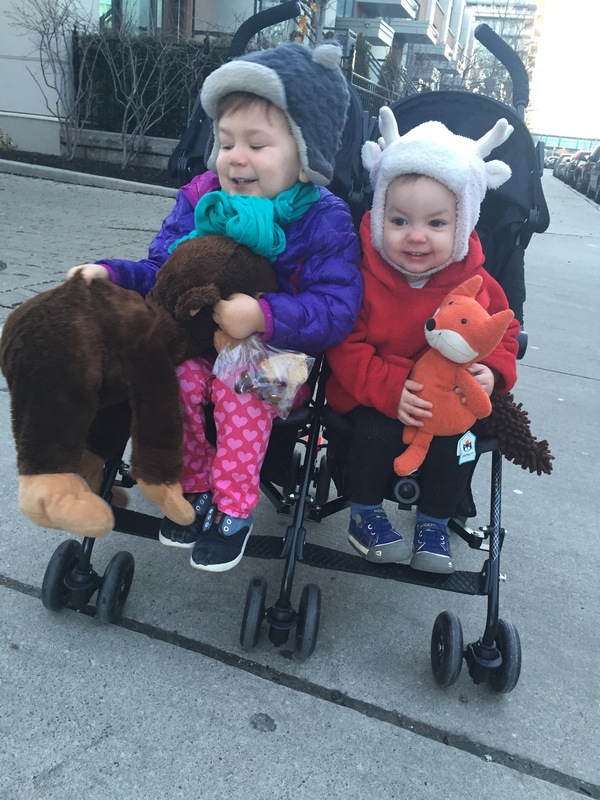 I had Dylan in the stroller and Carter, with no hesitation balance biked all the way home. From there he would go longer distances. A few times he’d bike in to school in the morning so Daniela could get an earlier departure. It blew my mind. 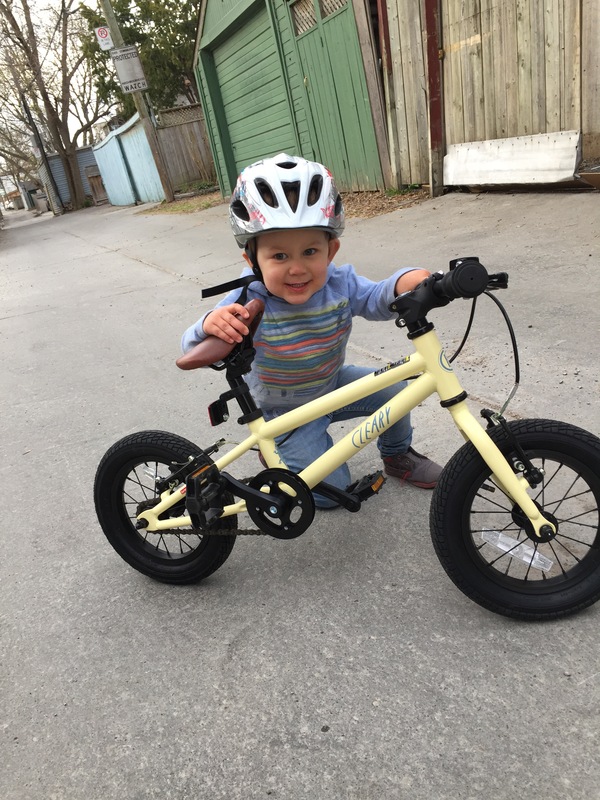 At the beginning of April Carter asked me for a pedal bike “with NO training wheels.” I’m not sure where he learned of such a thing or why the sudden need. I thought it was absurd but I started researching bikes and in that process found a bike that retails for $250USD on sale at a Canadian store down the street for $100CAD. This felt like an absurd amount of money for a bike for a three year old that I was sure wouldn’t be ridden but it was such an incredible deal I felt confident I would be able to resell it if it didn’t work out and if it did work out that it would last through Carter and Dylan and then some. We brought it home, he climbed on, I held on tight to the seat, he pedalled while I held him steady. It was a wreck. Clearly he wasn’t ready and I wasn’t either. After about 5 mins he asked for his balance bike back and that was that. On April 28th as we were leaving Karate with Carter on his balance bike we saw Carter’s buddy climbing on to his tow-a-bike with his mom. I talked to Carter about it as his pal showed it off. Carter had no reaction. He rode in silence for a few blocks and then stopped and said “MOMMY! I have a great idea!” while holding up his pointer finger (adorable). I was impressed that he had spent all that time trying to figure out a way that he could have what his friend has. I explained that his bike wasn’t made for that but it was a good idea. I told him that once he was better at pedalling we could look at getting a similar bike. It was late in the evening but I felt confident that it would be another 5min trial so as we got home I ran in to grab his bike. I brought it out, helped him climb on and then before I knew it he pedalled away. I was terrified and stayed super close to him making sure I’d be able to catch him, but he didn’t need it. Just like that he knew how to pedal a pedal bike. The following day I simply told him how to use the hand brakes and he picked it up immediately. He was still a little wobbly with steering and lacked the ability to actually climb up on seat by himself so I didn’t really let him ride anywhere. He stayed on the balance bike as a form of transportation. About a week ago he watched a kid in the park biking around and when we got home that day he asked for his pedal bike. He tried to get himself up onto the seat by himself but really struggled. I tried to explain leverage and help him work it out but it just wasn’t happening. I told him it was okay to go back to his balance bike but he just sat there for a few minutes and then said “Oh! I got it!” He climbed on and put one foot on a pedal and used the other foot to push along and pick up speed. Once he’d picked up speed he pushed up onto the seat and got his other foot on the pedal. He has biked every day since that day. Four days after figuring out this skill he biked a total of 5 miles with no assistance. He biked through the city to my work, then the hospital, then to his daycare, then the park, then Karate and finally home. He has so much physical capability now. It’s mind blowing. I love watching him work through things in his head before executing them. It’s so different form how his sister learns. Size – Huge. I have no clue of actual stats but I would not be surprised by 29lbs and 34″. I really need to check but she never stops moving. 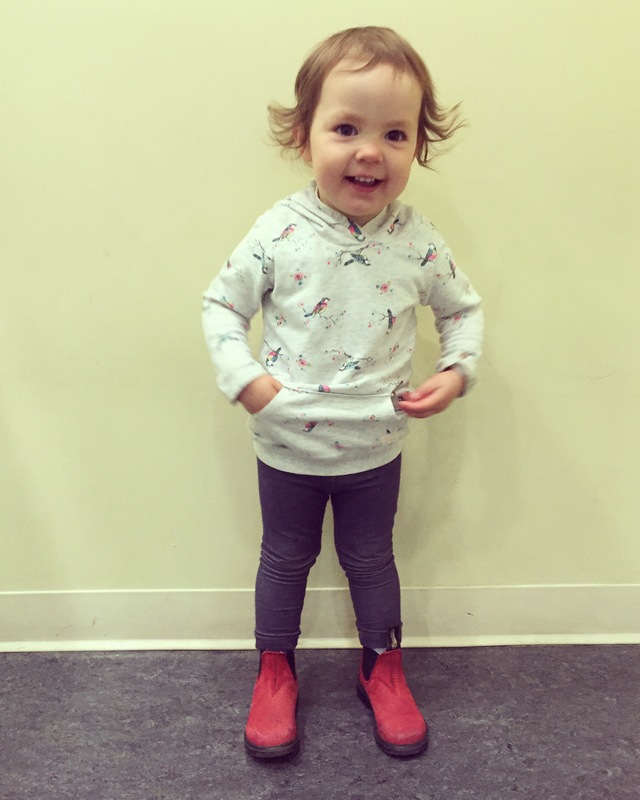 She wears almost all 2T these days and she has a size 6 foot (though she insists on wearing size 7 blundstones). She’s bigger than some of the kids in the pre-school class. She’s a tough cookie with strong body awareness. 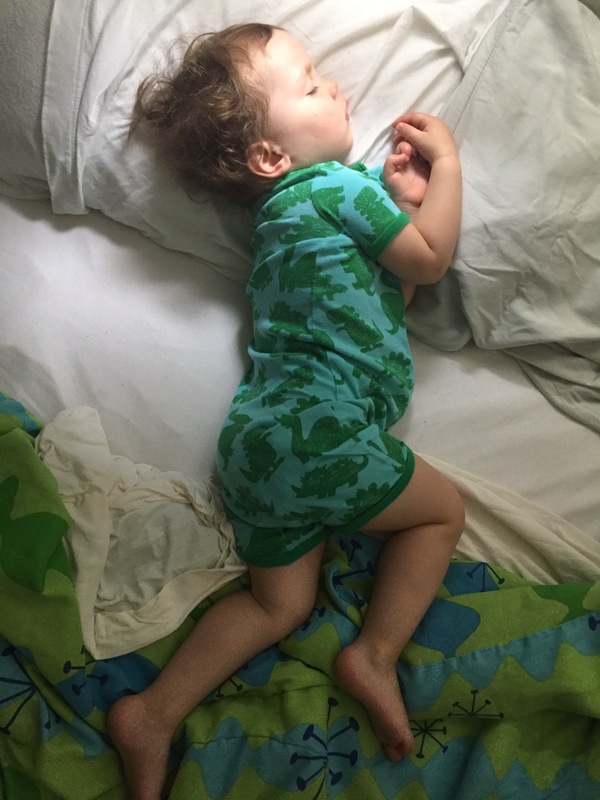 Sleeping – Sleep is still hit or miss with this kid. She goes to sleep easier now since we decided to take the recommendation of giving her melatonin at bedtime. She had been so overtired and miserable and as soon as we started doing this her language exploded and her hair started growing. It was shocking. Sleeping through the night is still a rarity but I think that there are usually less wake ups. They are still sharing a bed and are happy with it but I’ve been thinking about moving them into separate beds at some point soon. We’ll see though. Teeth –16 wonderful teeth and her first dentist appointment coming up. She is more resistant to help with brushing than Carter is but overall I’m not too concerned. Eating – Still an awesome at eating all sorts of things but is without a doubt eating less these days. She used to eat multiple servings and she mostly only eats one now. She is excited to move onto the next thing whether it’s going outside, going to read books, playing, etc. 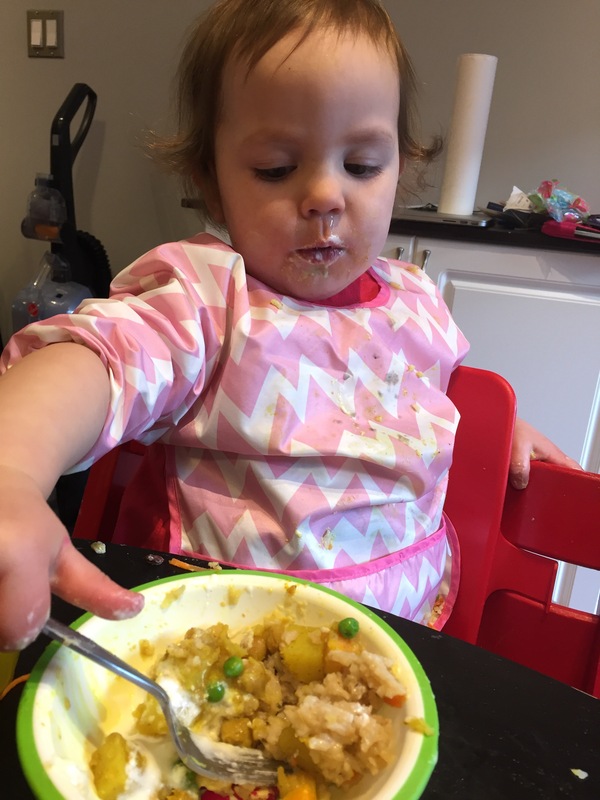 Her favourite foods are chipsies (rice cakes), yogurt, booboogapes (blueberries or grapes), cereal, green beans, broccoli and chick peas.Talking – We have mini sentences, lots of chattering, answering questions and just awesomeness. She can tell me what she had for lunch (Carter usually confirms this) and she will tell me what she did during the day. At night I ask her for her highlight and lowlight of the day. Yesterday her highlight was just “Sharon” and I said back to her “You liked seeing our neighbour Sharon?” which she confirmed. Her lowlight was “Fell, hurt hand.” She is able to paint a decent picture of what she thinks about things which is so amazing. Carter is great about talking to her and trying to understand her and I think this really helps her feel confident speaking. She sings all the time, she recites Carter’s karate pledge.Playing/Strength – Dylan can ride a tricycle. She rides it on her own. It’s not fast but she can do it. This is amazing to me. Carter started riding it when he was a little over two. He had longer legs at that point and I was still amazed. Dylan just has sheer willpower. She rides a scooter. 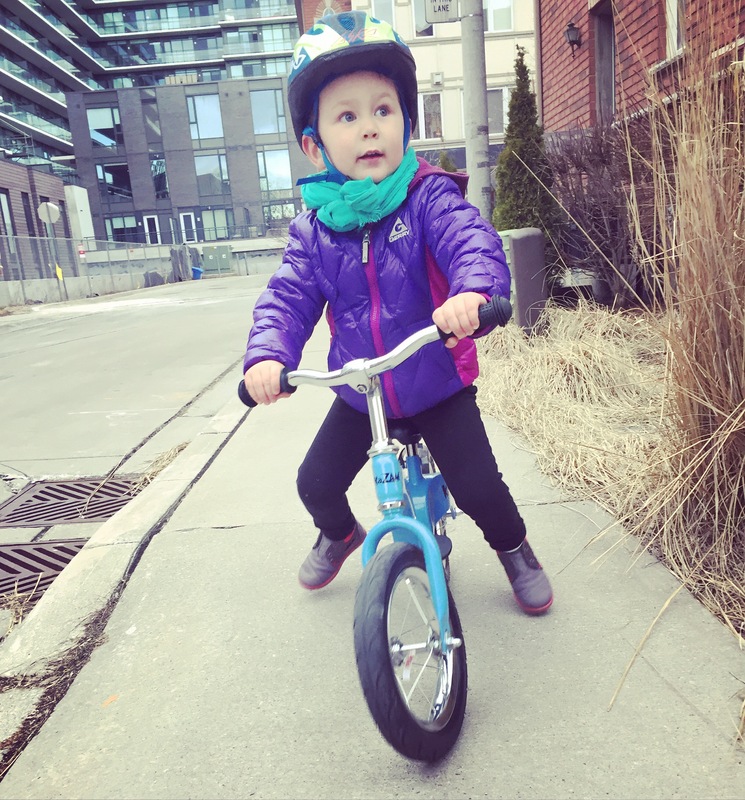 She rides pretty slowly on a balance bike with very limited balancing. she climbs. She hangs. She jumps. She is a built kid. Dylan has gone from a constant energy drain to an energizer. Her excitement for everything is contagious. She is independent and curious. She loves going to playgrounds and navigating new elements. She is intelligent and strong-willed. She copies everything Carter does (good and bad). She LOVES to be outside. She has her own sense of style that feels pretty 90s lesbian/punk to me which is hilarious. She seems older than she is based both on her size and her attitude. I often forget that she isn’t even 2 yet. She loves people fiercely, gives strong hugs, and asks for the people she misses. Daniela and I spent our first night away from the kids on Saturday night. 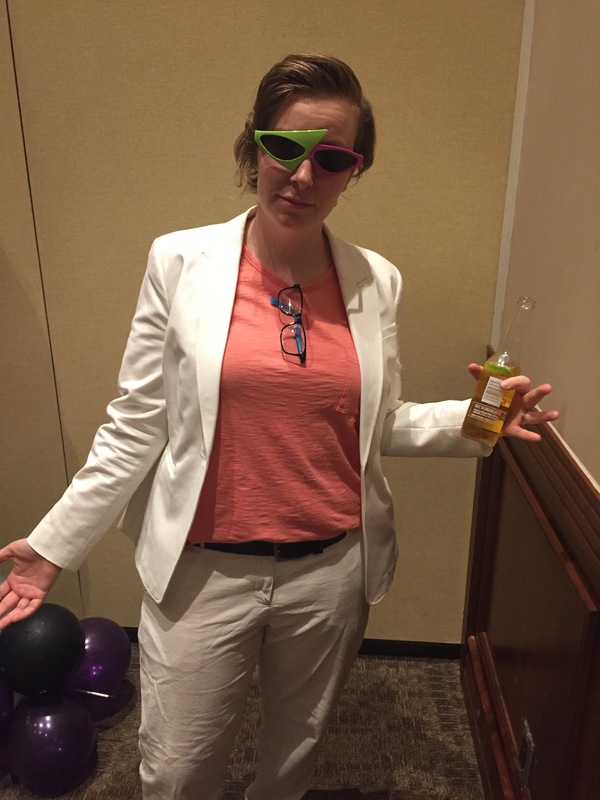 We were attending an 80’s Prom Themed Birthday party out of the city and logistically it made the most sense to leave the kids home with someone so we did it. 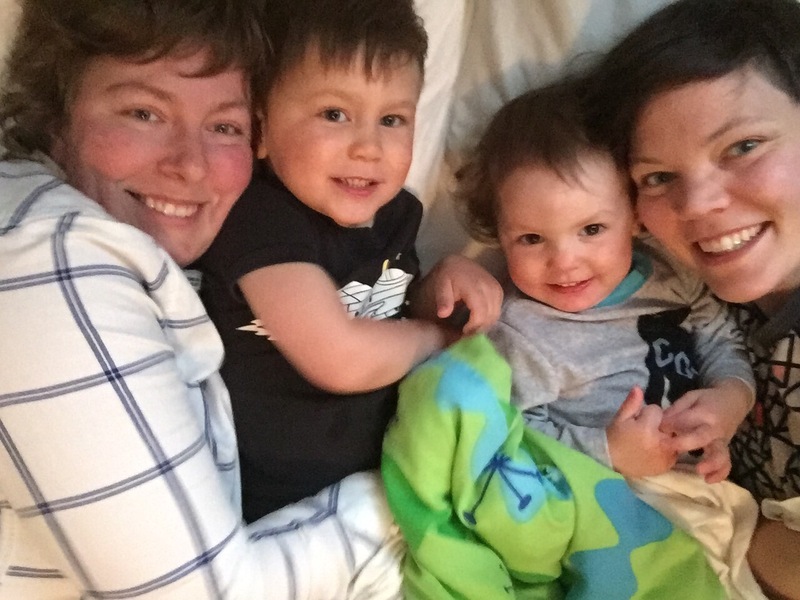 We left around 2pm and they were taken care of and loved by Dylan’s God Mother until the babysitter could arrive a couple hours later. 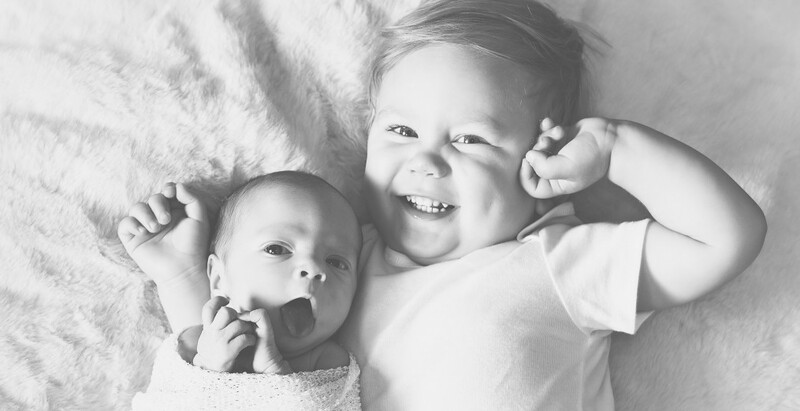 Dylan had just drifted off to sleep before we left and there was peace in the house with just the perfect amount of Carter excitement to share his toys and tell stories to someone he hadn’t seen in a while. He knew that we were going away for the night and that C would be staying over with him until we got home in the morning. 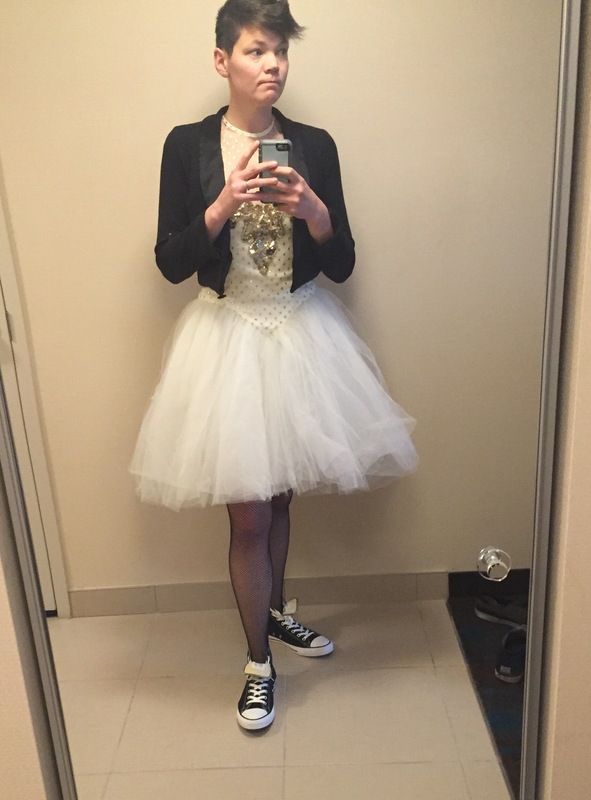 My heart ached a bit and I wasn’t exactly excited for the party but I felt really ready for this night away. He barely acknowledged us as we were leaving and we didn’t hear much from them over night but coming home to happiness, hugs and adorable stories was so perfect. I should clarify that these weren’t actually notes, just snippets of stories from our MAGNIFICENT babysitter. At teeth brushing time she felt they’d done a sufficient job and told them to go hop in bed. Both kids ate all their broccoli, played outside, read books, fell asleep peacefully by 8pm and then slept through the night. They were somewhere right around dream children. We got home around 10:30am and everyone was still in their pyjamas having a dance party and playing in the living room. They excitedly squealed when they saw us and wrapped their arms around us. 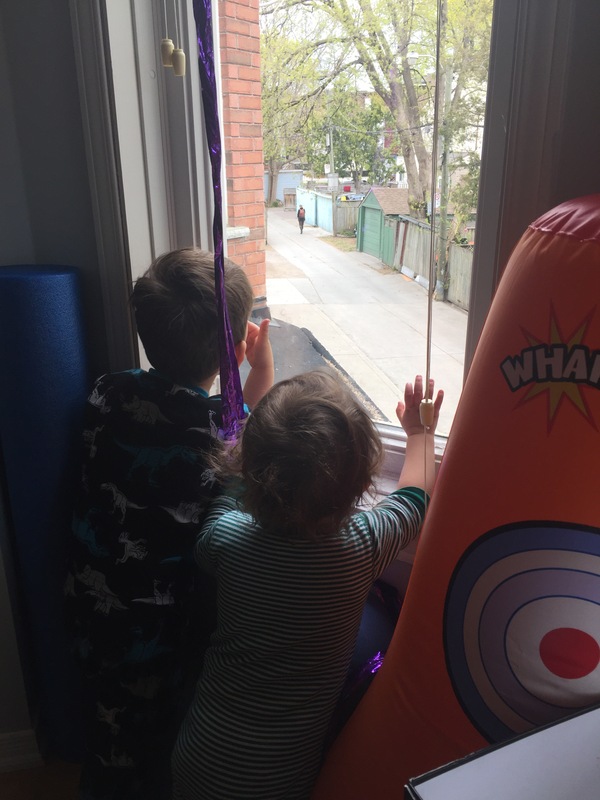 They were thrilled with the balloons we brought home from the party. It was a successful experience both in terms of them being without us but also in terms of giving us a little break. It likely won’t happen again for a long time but I’m so glad to know that it can happen. This week feels fresh, like a reset button has been pressed. Did it, now I’m over it. So Dylan was pretty much a potty user for a few weeks. It was wonderful. Diapers seemed like they would soon be a thing of the past. One day she came home from school and flat out refused to use the potty. When we told her that if she didn’t use the potty she would have to wear a diaper, which in the past had resulted in her rushing to the potty, she instead rushed to get a diaper and bring it to us. We tried to work through it over that weekend and encouraged her and the likes but she just would not even sit on the potty. We let it go but for some reason she continued to use it at school. This weekend she randomly decided to start using the potty again but over all who knows. She’s a strong personality and it’s quite possible it just stopped being interesting to her. While I very much would like to be done with diapers, it’s not something i’m going to push with her right now. Life has been busy lately, filled with both good and not so good things. Kids are growing constantly and fabulously. I can’t keep up with the growth some days and clothes that they’ve been wearing all winter are suddenly too snug. 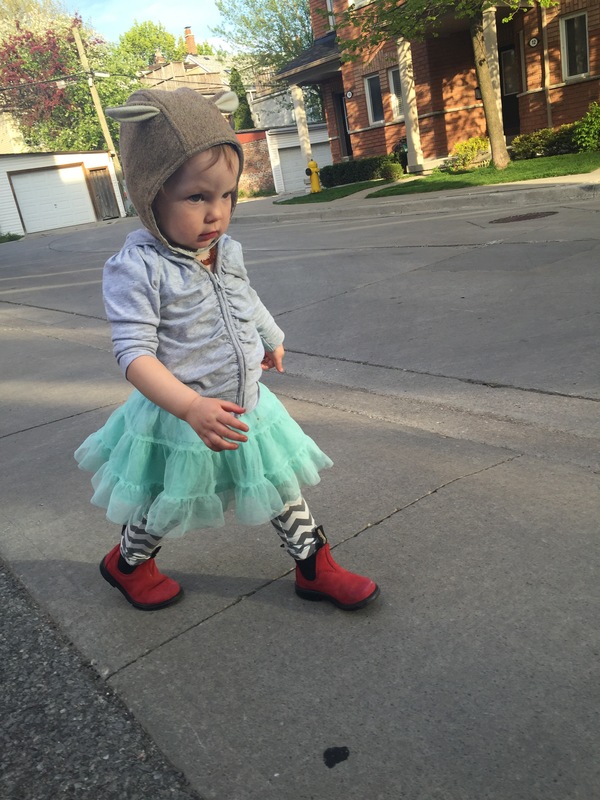 It appears that you stop getting hand-me downs around 3t. This is probably okay considering Carter has a very particular style that wouldn’t align with most hand-me downs. 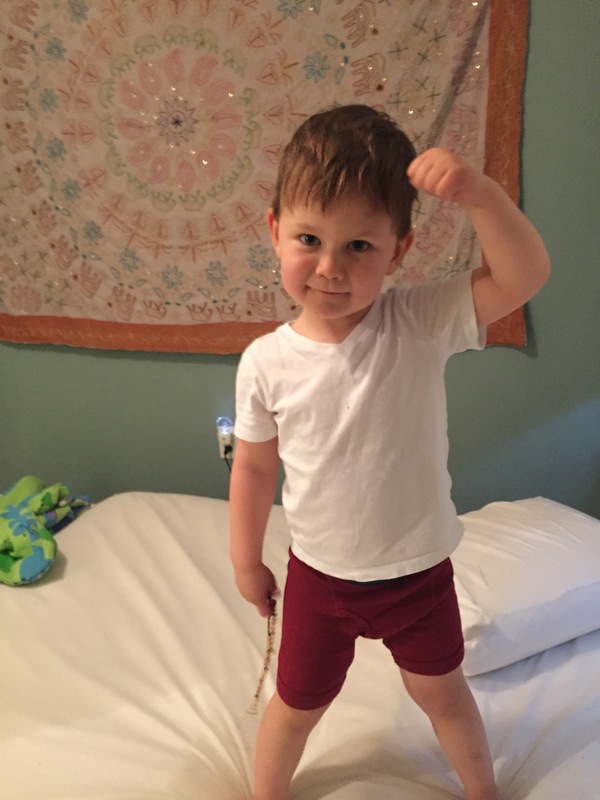 He went through a 2 week phase where he wouldn’t wear any pants with a zipper but still refused to wear sweatpants (what the hell kid?). Dylan wears jeans almost everyday. Anytime I suggest something other than jeans she revolts. These guys don’t understand that this may be the only time in their lives that it is socially appropriate to wear the comfiest clothes you own absolutely anywhere. We’ve been vegetarian for over 6 months now and I’ve been mostly dairy free for almost 4 months. The only time I feel like it impacts me is when I’m somewhere with limited food options (obviously). Kid’s don’t seem to mind though Carter insists on “meat” on his pizza. They eat the fake cheese on occasion. They eat whatever food they want when they aren’t at home. I don’t want to dictate their diet. We do talk to them about the fact that we don’t eat meat or dairy but I don’t think they get it. Dylan has been talking a ton. She sings a lot of songs. She strings lots of words together. She can tell us about her day and she can can ask for what she wants. She still screams and when the answer is ‘no’ to something she often becomes inconsolable. Hopefully someday this passes. 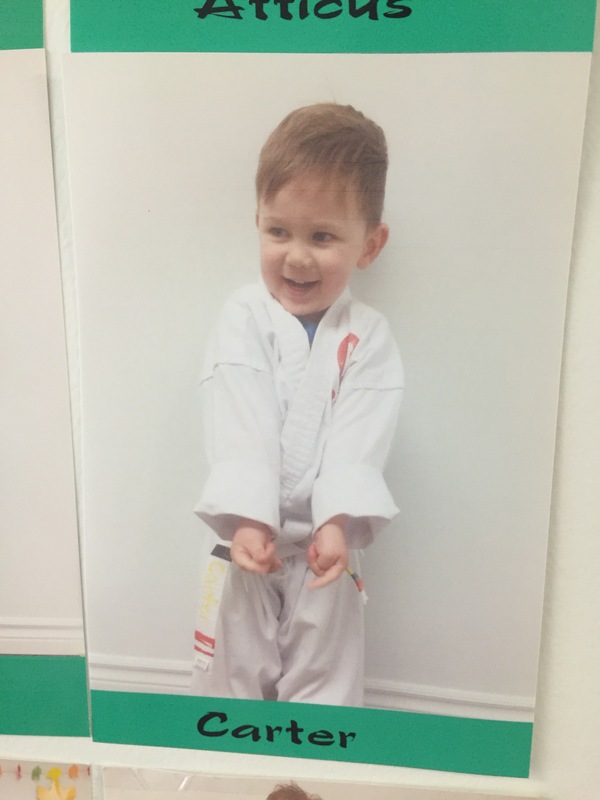 Carter is OBSESSED with karate. He really loves it. I wasn’t sure what to expect the first time I brought him but man he is in love. He started at the beginning of March and he’s gone over 20 times. His balance and strength has developed so much in that time but that doesn’t compare to his confidence. He is a different person. He uses his words well. He voices his opinion. He is more comfortable walking into a new situation. It’s fairly mind blowing. We’ve been back outside after the long mild winter. The kids are playing in the alley and running around with friends. Carter has moved from riding his balance bike in the alley for fun to using it as a mode of transportation. He bikes everywhere. He bikes home from school each day which is well over a mile. Last Saturday we went to see baby lambs at the farm/park and he rode all the way there and back with some additional stops along the way. In total, he rode over 4 miles that day. I couldn’t believe it. It’s by far the fastest place to get anywhere with him. When love is put in a cake.